It is self-respect or protective jealousy or justifiable jealousy in men towards their women (their honor) and it is a feeling of fury when one’s honor and prestige is challenged. It's an innate characteristic of humans. Both men and women share this instinct. In some relationship the woman's protective jealousy is more towards her husband and in some cases man is more dominant in this attribute. Protective 'justifiable' jealousy (Ghirah) is loved by Allah and His Messenger (pbuh). A man is expected to have Ghirah concerning the woman of his house – a wife, a sister or a daughter. Quran 4:34 says "Men are the protectors and maintainers of women..." It is good for a husband to be jealous if other men look or speak with his wife in a manner which is not appropriate. In public the modesty of a man is to lower his gaze when his thoughts starts getting wild. For a woman the modesty ordained by Allah is in the way she dresses. It is the husband's right to demand women of his house to dress per Islamic guidelines and refrain her meeting unnecessarily with other non-Mahrams. 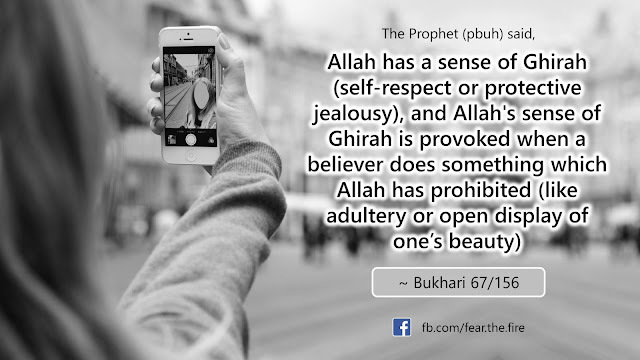 Let us not misinterpret that jealousy of all forms are allowed in Islam. For e.g. some are jealous when others are successful in business. Some get jealous if someone buys a good house or a good car etc. Jealousy in these form is definitely forbidden in Islam. One must understand that anything in extreme is disliked by Allah. Too much or unnecessary Ghirah is unhealthy as it leads to spying and distrust within the marriage. Husband cannot impose unnecessary constraint on his woman which Allah and His Prophet (pbuh) have allowed. For e.g. women can go outside the house when required (including Masjid) by wearing proper hijab. See the article on The Ideal Muslim Husband here. Ghirah of husband is justified to an extent that he does not overdo it (see the 'excessive jealousy' section below) and thus it is extremely important for a wife to understand this aspect. She must do everything it takes to ensure that the protective jealously of the husband is not compromised. Failing to comply on this one will only have turbulence in your married life. If you still don't agree, after reading this full article you will change your opinion in sha Allah. Also read an excellent article written by sister Fatima on 'Reviving our sense of Ghirah' to get a wider context. 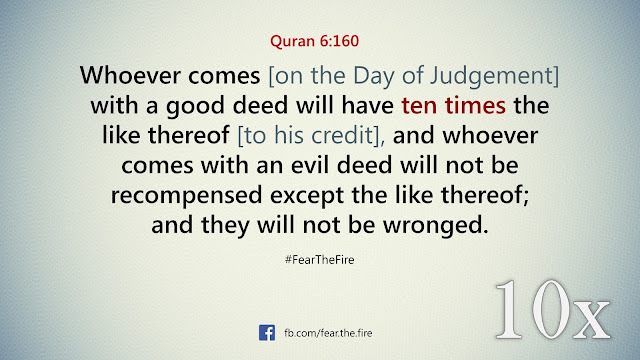 You must have read and contemplated on Allah's Ghirah above. Here are few more hadith on how The Prophet (pbuh) and his companions dealt with Ghirah. Saad bin Ubada, a companion of The Prophet, said, "If I saw a man with my wife, I would strike him (behead him) with the blade of my sword." This news reached Allah's Messenger (pbuh) who then said, "You people are astonished at Saad's Ghirah. By Allah, I have more Ghirah than he, and Allah has more Ghirah than I, and because of Allah's Ghirah, He has made unlawful shameful deeds and sins (adultery) done in open and in secret. 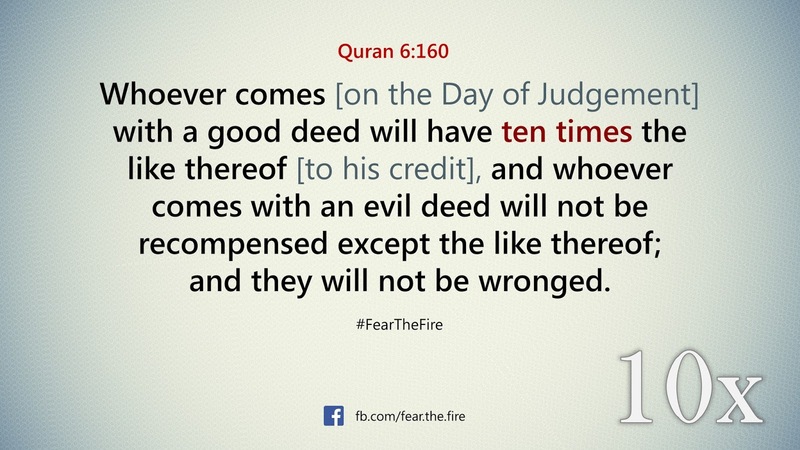 Here's another narration that make it clear why The Prophet (pbuh) approved Ghirah and in fact supported it. Asma bint Abu Bakr narrates, "When az-Zubayr married me, he had neither land nor wealth nor slave", so Asma had to work very hard kneading dough, going far off to get water. "And I used to carry on my head," she continues, "the date-stones from the land of az-Zubair which Allah's Messenger had endowed him and it was a distance of two miles from Madinah. One day, as I was carrying the date-stones upon my head, I happened to meet Allah's Messenger, along with a group of his Companions. He (pbuh) called me and told the camel to sit down so that he (pbuh) could make me ride behind him. I felt shy to go with men and I remembered az-Zubair and his Ghirah and he was a man having the most Ghirah. The Messenger of Allah understood my shyness and left. I came to az-Zubair and said, "The Messenger of Allah met me as I was carrying date-stones upon my head and there was with him a group of his Companions. He told the camel to kneel so that I could mount it, but I felt shy and I remembered your Ghirah." From wife's perspective: Look at the sense of dignity and modesty of Asma! See how she felt shy in front of other men? See how careful she was about her husband's feelings? She knew that her husband had a lot of Ghirah so she didn't want to upset him by accepting even Prophet's help even though The Prophet (pbuh) was the purest of men and even though it meant bringing more hardship on herself. From husband's perspective: And look at az-Zubair, even though he had a lot of Ghirah, he didn't want to inconvenience his wife. What a beautiful relationship they had! Among the companions of The Prophet (pbuh), Umar (r.a.) possessed a great amount of Ghirah. It was his ardent desire that the verses of hijab were revealed by Allah. When The Prophet (pbuh) was shown in dream, Umar’s hoor (wife) performing ablution in Jannah he did not enter the palace as a mark of respect for Umar’s Ghirah. While I was sleeping, I saw myself in Paradise, and suddenly I saw a woman performing ablution beside a palace. I asked, "For whom is this palace?" They (the angels) replied, "It is for Umar." Then I remembered Umar's Ghirah and went away quickly." To sum it up: Protective jealousy, when justified and shown in a moderate manner, is an indication of true manhood. Common sense says that anything done is excess is not good. That is one of the reason why extremism in all forms are disliked in Islam. Same applies for excessive jealousy as it leads to unwanted suspicion. Suspicion leads to (false) accusation and tends to weaken the marriage. 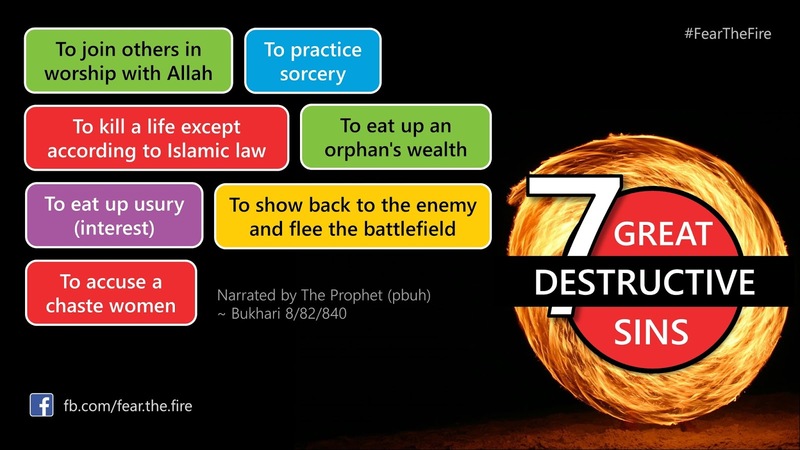 Thus to protect a woman's honor the Sharia went couple of steps ahead and said that accusing a chaste woman is one of the seven destructive sins!! See the collage below. Thus it is not permissible for us to unnecessarily suspect our spouse or even accuse them (directly or indirectly) without evidence, as this is very serious. Especially if the accusation is about a wife or a daughter or a sister chilling out with some other men or accusing them to have committed adultery. The sin of accusing a chaste woman falsely is so serious that it deserves to be punished by being flogged eighty lashes. It is also highly recommend that man should treat his women nicely and not try to do anything in excess that might dent the relationship. The husband must try to build his credibility first, by following Islamic laws himself, and then must advise his wife to follow them. 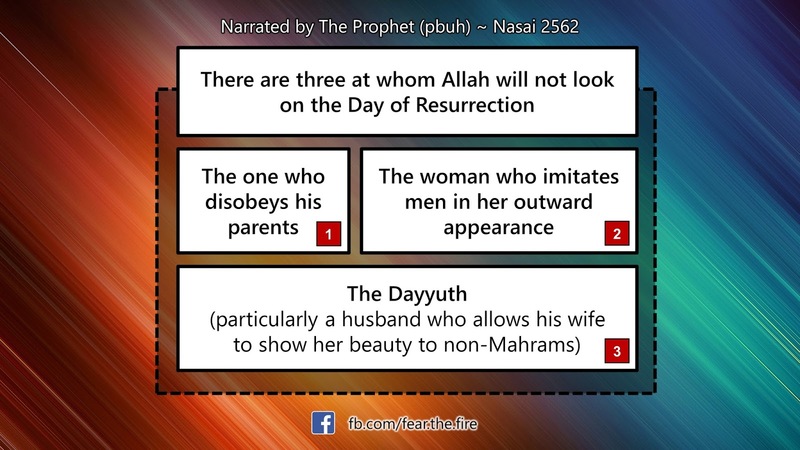 Also remember that there's zina (adultery) of eyes which many men invariably commit. Hence it is extremely important for women to safeguard themselves from such fitnas. 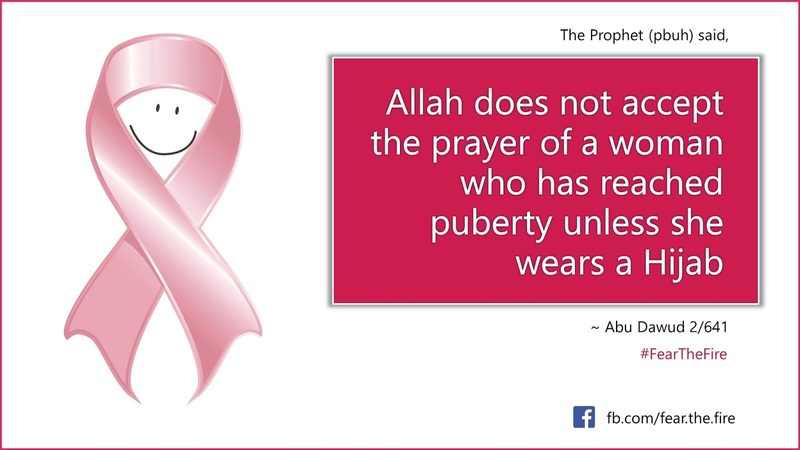 Women, who has reached her puberty, must wear hijab. This is a head cover that gets extended till her bosom. Apart from head cover the woman is expected to wear an abaya which must cover her entire body and is loose such that the curves of the body are not visible. In addition the body cover must not be transparent in a way which shows what's beneath the abaya. Apart from these the woman is commanded by The Prophet (pbuh) to obey her husband at all times. The woman should respect the Ghirah of her husband and avoid anything that leads to husband becoming upset by her behavior. 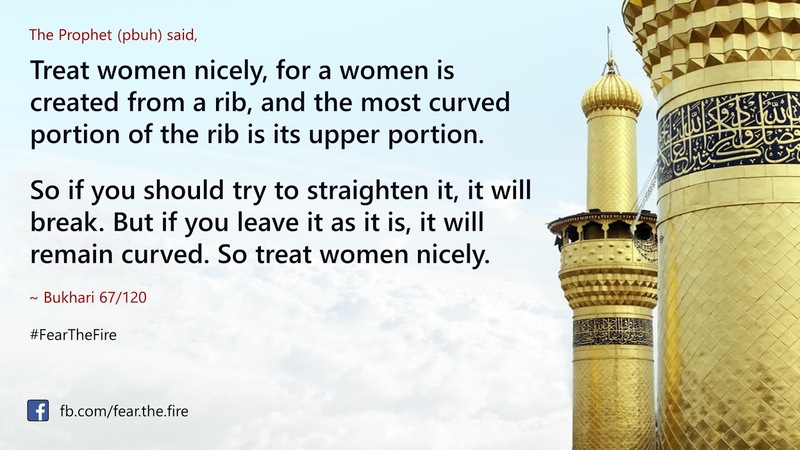 Hadith #2 of Asma bint Abu Bakr above is the best example. Ideally a wife should dislike meeting or talking to a non-Mahram or in the least should keep the conversation short. However if the husband does not like his wife to meet a particular person (esp. her non-Mahram cousins and friends) she should respect that. The happiness of a wife should be in happiness of the husband. We should be aware that most of the temptations that befall families come from friends or near relatives, so if the husband is asking his wife to avoid them then the wife must try her best to protect herself from that. 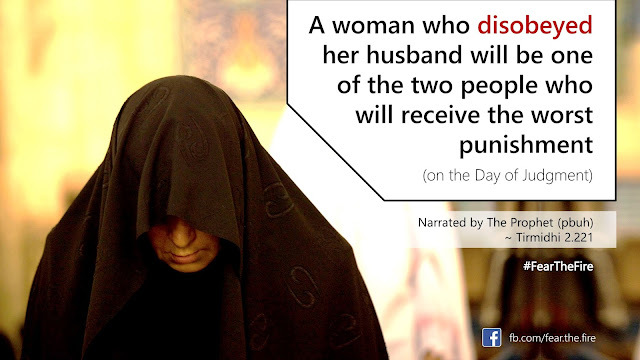 The ego of the wife must not come in between Allah and her husband. If Allah and His Prophet (pbuh) has commanded something and the husband is reiterating that, then it is obligatory on the wife to comply. Burying the ego will only elevate her status in the eyes of Allah, and get greater reward in the Akhirah. 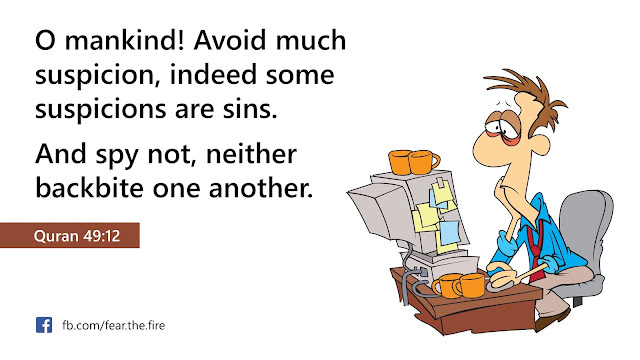 Lastly, please know that there are lot of avenues to sin in the 21st century. And as the herd mentality goes, we land up committing major sins by being influenced due to peer pressure. One such avenue is taking non-halal selfies and uploading them on the social media sites. Psychologists have said taking too many selfies is a mental disorder and signs of narcissism. So please safeguard yourselves and your woman from prying eyes and and from indecent selfies which are today socialized on WhatsApp, Instagram, Facebook, and other social media channels. There are two extreme situations in Ghirah. The first extreme situation is the excessive jealousy, as explained above. The second extreme situation is the absence of jealousy, which is called as Dayyuth. A Dayyuth is a man who has no sense of honor (protective jealousy; Ghairah) when it comes to his wife and family. He has no objection if the woman of his house go out without Islamic dress code and how their women appear in front of other men. Therefore Ad-Dayyuth is a person who does not care what his wife or sister or daughter wears and how they carry themselves in public - be it the virtual world today or in the physical world. Ironically in the times we live there are several families where husbands (including in-laws) want their wife to abandon hijab and abaya so that the world sees how good looking and charming their wife and daughters are. This is a major sin, as it is contrary to the law of Allah. 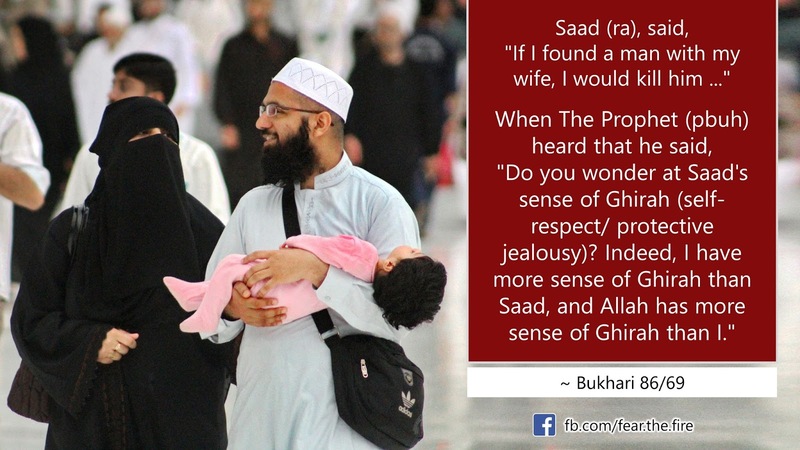 One who lacks Ghirah is the one who does not care if (non mahram) men approach his wife, mother, sister or daughter. 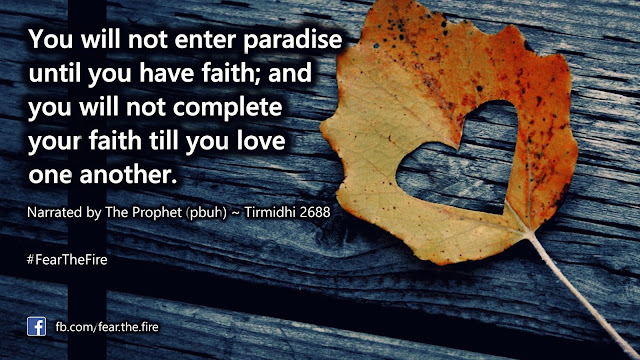 A dayyuth is prohibited from entering Paradise. And the Dayyuth (the man with no jealousy over the woman and his family) is the most vile of Allah’s creation, and Jannah is forbidden for him, (because of his lack of Gharyah-jealousy). A man should be “jealous” with regard to his wife’s honor and standing. He should defend her whenever she is slandered or spoken ill of behind her back. 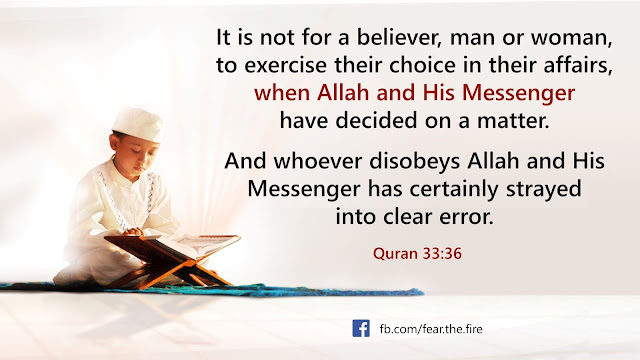 Actually, this is a right of every Muslim in general but a right of the spouse specifically. He should also be jealous in not allowing other men to look at his wife or speak with her in a manner which is not appropriate. Caveat - beware, O Men! Haste is only from Shaitaan. As the head of the house, the father or the husband or the brother needs to be cognizant about the fact that there is a good way of enjoining something which is good. Immediately asking your spouse or daughter or sister to change is not the way to enjoin a Fardh, given the fact it was not imposed upon them in the past, for whatever reasons. The change must be implemented gradually and in a systematic way so that the woman in your house understands what is obligatory on her and why it is necessary for her to comply on this obligation. Once understood majority of the problem is solved there. All attempt must be made to avoid conflicts and for that it is advisable for the man of the house to exercise patience. More so he should have enough reputation and the credibility where he has demonstrated himself as a practicing Muslim in the past. In hindsight, we should remember that it took many years for many of the obligatory rulings to become obligatory in early Islamic days, hence not prudent to jump from zero practice to perfection in the first day. Simply don't! If your husband or father or brother is uncomfortable towards a certain situation (wife/daughter/sister talking to a non-Mahram), his jealousy is justified and Allah likes it. However, if your wife is a chaste believer, and you have never seen something wrong with her behavior you should not keep an eye on all her actions. This exaggeration will ruin the marital relation. In summary Allah loves the jealousy which is the outcome of profound doubts, but He hates the one which is unjustified, and which negatively affects the relation between the spouses. Just as the husband feels jealous over his wife, he should consider his wife's jealousy over him. It is haram (forbidden) to show his admiration for other women, except his Mahrams. Lastly Ghairah is a noble quality, but like all other noble qualities, it becomes an evil quality when it is taken to an unlawful extreme. A man who has a moderate and praiseworthy level of Ghairah is not needlessly suspicious of his wife; nor does he spy on his wife without just cause. At the same time, he is not indifferent to his wife’s behavior; rather, he makes sure that she stays away from all unlawful activity and vice-a-versa.